Malawi, a largely agricultural country, is making efforts to overcome decades of underdevelopment and the more recent impact of a growing HIV-Aids problem. For the first 30 years of independence it was run by the authoritarian and quixotic President Hastings Kamuzu Banda, but democratic institutions have taken a firm hold since he relinquished power in the mid-1990s. Most Malawians rely on subsistence farming, but the food supply situation is precarious and the country is prone to natural disasters of both extremes - from drought to heavy rainfalls - putting it in constant need of thousands of tonnes of food aid every year. However, since 2007 the country has made real progress in achieving economic growth as part of programmes instituted by the government. 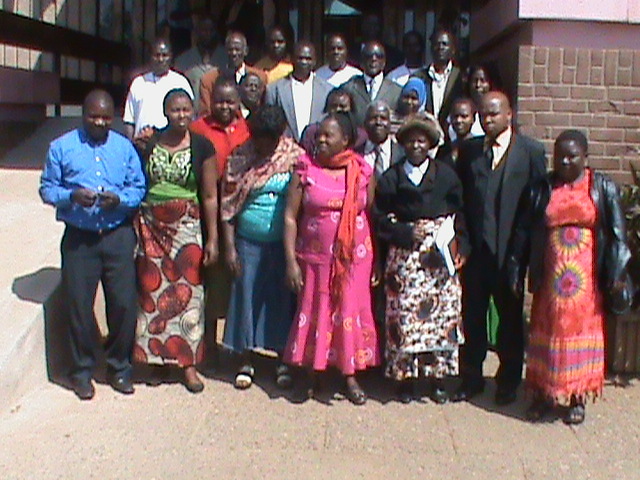 Early in the month of August the Malawi Federation had set out to conduct their enumerations. The exercise which targeted two settlements in Lilongwe city was funded by the Slum Dwellers International through its additive called CCODE (CENTRE FOR COMMUNITY ORGANIZATION AND DEVELOPMENT) located in Lilongwe. The Kenyan federation took pride in setting bench marks in various Enumeration processes. The exercise took place in Mtandire and Chinsapo settlements. According to Mrs. Emily Mwangi, a member of Kenya’s Muungano Federation expressed sentiments that it is important for the Malawi Federation to spread the gospel to the community to enable the enumerators go through the process without any problems. She added that they have a great advantage because the Lilongwe City Council is willing to work hand in hand with the federation in the city. During the meeting, the Kenyan team was briefed by their Lilongwe counterparts about the ongoing data collection process. The data was to aid in an informal settlement upgrading project scheduled to run from the year 2010 – 2015. The funds for this project had been donated by Bill and Gates Foundation. The project was being carried out through Lilongwe city council. Chinsapo and Mtandire settlements had hence been earmarked for this project and the city council was having a partnership with the federation as well as CCODE to help implement the project. It was agreed that the Kenyan team will be visiting Mtandire the day after to assess the progress of the process and give a helping hand where necessary. The team was later on dispatched to the various accommodation places where they were to be hosted throughout the process. The team was hosted within the settlements where the process was taking place. The federation members hosted the Kenyan team with CCODE hosting MuST staff from Kenya. The team visited Mtandire to assess the numbering progress. Exchanges are meant to be a learning platform for Slum dwellers across the world .After cross examining the numbered structures, a number of mistakes were identified. They are highlighted below: a) Inability of the numbering team to distinguish between structures belonging to different households as well as those belonging to one household. b) Inconsistency in the numbering codes. c) No records for the numbered structures. d) The whole team working at one point instead of dividing the team into various parts of the settlement to enhance efficiency and effectiveness. Based on these challenges, discussions were held on the way forward for the process. From the discussions, it was agreed that a numbering sheet be developed and printed to be used in recording the numbered structures. It was also agreed that the numbering team to meet together in the afternoon and be led through the discussions by the Kenyan team to highlight some of the mistakes and re-train them on the numbering process. The training was divided into three parts i) Drawing of the settlement map ii) Development of the numbering codes iii) Filling of the numbering sheet The settlement map was drawn by the community members under the guidance of Emily Mwangi from Kenya. From the settlement map, the community was also led through a process of dividing the settlement into six clusters. The six clusters were meant to provide a smaller working area for the different teams so that the numbering team will be more effective as compared to the already created two clusters in which all the members were clustered into two groups. The numbering team was also led through the numbering code by the Kenyan team. It was agreed that: MT/01 was to be the cluster code for cluster 1, MT/02 was to be the cluster code for cluster 2, MT/03 was to be the cluster code for cluster 3, MT/04 was to be the cluster code for cluster 4, MT/05 was to be the cluster code for cluster 5 and MT/06 was to be the cluster code for cluster 6. The team was also led through filling of the numbering sheet by Simiyu from Kenya. Each of the numbered structure was to be recorded. The numbering sheet consisted of 10 columns. In the first column, the person filling the numbering sheet was to enter the house number (in this case the number written on the door of the structure). In the second column, the person was to fill the use of that structure. Some of the possible structure use included business, residential, institutions, toilets, bathrooms and kitchen. If the structure use was either business or residential, the person was to fill in the third column its type and in the fourth column its name. For example, the different types of businesses included shop, grocery, restaurant, maize mill and vegetable vendor. The different types of institutions included schools, hospitals, churches and mosque. In the fifth column, the person was supposed to fill the construction materials used for walls whereas those for floors and roofs were to be filled in column six and seven respectively. Column eight was to be filled the length of the structure in meters whereas the width of the same was to be filled in column nine. The figures entered in this case were approximate values since the actual value can be found once mapping has been carried out. In the last column, the person was filling any remarks concerning the numbered structures. Some of the remarks included house under construction, self contained house, house in poor condition among others. Having sorted out the numbering issue in Mtandire, the Kenyan team moved to Chinsapo to train them afresh on the numbering process. Chisapo had not been trained before when Mtandire was being trained and hence it was fresh start by the Kenyans. 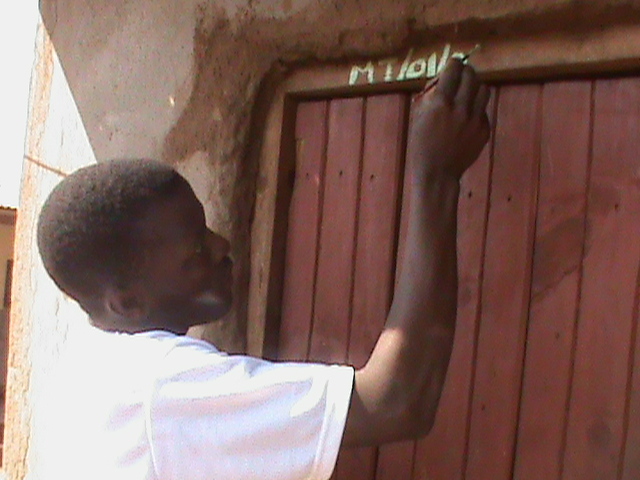 We had a team of 40 enumerators that was to be trained to do the numbering process. They were led through settlement map drawing as well as clustering. In total, the settlement was divided into 11 clusters. Chinsapo was much bigger as compared to Mtandire. They were led through the numbering codes and the filling of the numbering sheet by Mwanahamisi Hassan from Kenya. Later on they were led through a numbering pre-testing session by Simiyu and Mwanahamisi in one of the clusters (i.e. cluster H). The training process was carried out in Chinsapo primary school. The whole team was then divided into the 11 clusters with each cluster having either 3 or 4 members. The teams agreed to meet at the office the following day at 8 a.m. to be given the materials and be dispatched to their various clusters. On the other hand, Mtandire which was supposed to have picked up with numbering in their various clusters, failed to pick up due to a misunderstanding between the supervisors and the village elders. Despite three of the Kenyans having been send their in the afternoon to help sort out the politics, the leaders insisted on entire team numbering in only one of the clusters. This led to a meeting in the evening between the Kenyan team, CCODE, and Federation members. From the federation we had Namaona, Serah and Carolina. From CCODE we had Patrick and Joel. The meeting discussed mainly the situation in Mtandire, the challenges faced as well as the way forward on the same. Some of the resolutions agreed on were: i) The Kenyan team to be split into two with three members (Emily, Felistus and John) to be in Mtandire and two members (Mwanahamisi and Simiyu) to be in Chinsapo. ii) The Kenyan team to be in the field early enough to help split up the Mtandire group into their various clusters. Each of the three Kenyans was to help monitor two clusters in Mtandire. The driver was hence instructed to pick them on time. iii) The federation to take the leadership role of the whole group and provide guidance where necessary. This was to avoid creating the conflicts that had been witnessed during the day. iv) Those resisting their doors being numbered should be allocated a number on the numbering sheet and noted down in a notebook so that the same number can be written on the door in future once the person has agreed to the process. This was to help in consistency of the numbers and also avoid delays. v) Patrick to help in coordinating both Mtandire and Chinsapo to ensure each area is moving on well. Due to the vastness of the Chinsapo settlement, contact person were identified in each group and given the group in charge contacts so that they can communicate at any moment. After all the groups had been assisted to move on with numbering in their various clusters, the group in charge (Kenyan team), had the responsibility of monitoring all the groups in their control to ensure everything was moving on well and the groups do not deviate from what they were taught in class. After the groups had finished the day’s work, they were taken through a reporting session. During this time, the groups gave a report of what they have been able to accomplish during the day, the challenges faced as well as the lessons learnt. On average both settlements numbered approximately 2500 households. Given the estimated combined households of 20,000 for the two settlements (12,000 for Chinsapo and 6,000 for Mtandire), if the groups were to work at the same rate of 2500 households per day, then numbering was to take an average of 7 days. Given the bigger team in Mtandire, the number of days was estimated at 5 for numbering whereas for Chinsapo, the smaller team was estimated to finish numbering in 7 days given the higher rate they managed to work on the first day of the process. In Mtandire, the team was led through the training by John Thuo at St. Teresa Nursery school. In Chinsapo, they were led through the training by Mwanahamisi at federation offices. Simiyu was coordinating both the trainings to ensure uniformity of the process. The rest of the team was helping where necessary. After the training, both teams were tasked to do a pre-testing on the following day between 8 and 9 a.m. to ensure that they had understood what they were taught and also to be able to go through the forms and identify some of the mistakes to be corrected before the actual enumeration process begins. After 9 a.m. the teams were to continue with numbering in their various clusters. The day ended with a meeting between Patrick and Edwin to discuss some of the issues pertaining the process. The meeting was held at Longonot guest house and some of the issues resolved included: a) The Kenyan team to participate in a meeting to be held the following day with the Lilongwe city council. The various parties to the meeting included; traditional authority from both Lilongwe and Blantyre, CCODE, federation members from both Lilongwe and Blantyre, Project coordinating committee from the Lilongwe city council and then the Kenyan team. b) The teams will be split in both Mtandire and Chinsapo so that half of the team continues with numbering whereas the rest of the team moves on to enumerations. Once the numbering is done, the teams will be merged again to continue with the enumerations. c) Concerning the mapping, it was agreed that since the image had not been acquired, then it was of necessity to acquire the image first and do the digitization of the features of importance as soon as possible so that the Zimbabwe team can come and help in the mapping process. Cynthia was to follow up with Mathenge from Kenya to help get the image whereas the city council was to help with the digitization. d) CCODE was to help in monitoring of the process as well as organize on how the data will be entered into the database. John was to meet with the I/T person in CCODE the following day to discuss the database developed. A meeting was held in Lilongwe city assembly in which the project report was given. The Kenyan team shared the experiences of the federation in Kenya and had a chance to compare the situation in Kenya with that of Malawi. During the meeting, Lilongwe city was identified to have about 24 settlements and the federation was challenged to do a profiling of all the 24 settlements. Blantyre team also felt challenged from what was happening in Lilongwe and took it upon themselves to follow up with Blantyre city council to ensure the similar efforts can be done to improve informal settlements within Blantyre. Later on the team met with the federation team overseeing the process from both settlements at Chinsapo. During the meeting chaired by Patrick, the teams had a moment of reflection on the one week stay for the Kenyans. They also shared some of the mistakes done during pre-testing of the enumeration questionnaire and corrections that need to be done before any person is tasked to do the enumerations. Some of the submissions from the meeting were: a) Due to limited time for the Kenyan team, as a result of the amount of work involved in the ground, the team didn’t get time to interact with the federation members on the ground. Despite this shortcoming, two of the Kenyans (Simiyu and John) managed to visit federation houses at area 49. In fact one of the beneficiaries was taken through an interview as part of the documentaries the Kenyan team managed to collect from Malawi. b) The Kenyan team had worked very hard to help put everything in order, especially for Mtandire, and the challenge lay with the federation to sustain the efforts that had been done by the Kenyans. c) The federation as well as CCODE had learnt a lot from the Kenyans both in terms of process, logistics and leadership. d) The Kenyans had also learnt a lot especially on the family hood that exist within the Malawi federation. In deed being accommodated within the settlements was a great lesson in itself. On the sidelines of the Enumeration exercise, speaking to Muungano media team, Mr. Masaoku Namaona pledged that, the skills they got from their Kenyan counterparts were insightful and helpful and they believe they will conquer the challenge of upgrading all informal settlements in Malawi. The Muungano wa Wanavijiji Alliance is affiliated to SDI and comprises: Muungano wa Wanavijiji, the Kenyan federation of slum dwellers, which operates through 30 regional networks that are active in 14 Kenyan counties; Akiba Mashinani Trust, the Kenyan urban poor fund, a housing development & finance agency; and SDI Kenya, an NGO providing professional and technical support to the federation.